Ok so here is the blog to go along with my lastest project. I really wanted to do something in the shop from start to finish yesterday. I was cutting up some wood I got from work due to storm damage and decided to cut a few otherpieces that have been floating around in my garage for a while. 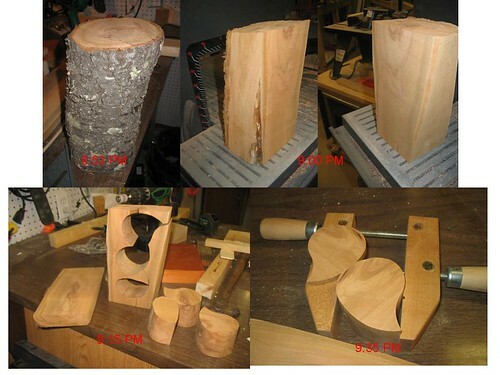 A bandsaw box is something I have been wanting to really try for a while (made a few experiments) So here is the process I took from a fresh log. Sorry did nto get nearly as many pics as I guess I should have but hopefully you’ll get the idea. After adding the wells. 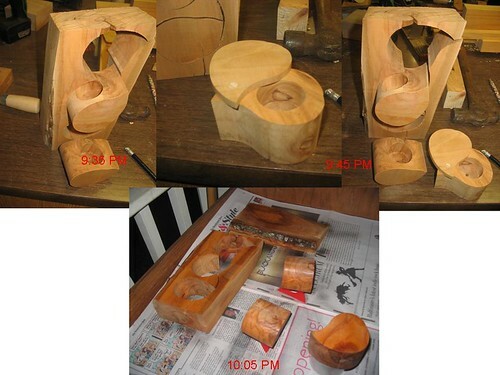 A lidded box ( I like making these pivoting lid type) which fits into the top hole. I think i goofed when cutting the second drawer out and cut it upside down to the drawer has a angle to it and only goes in from the back. I decided it was a nice feature. Only a small amount of sanding was done before I used a spary on laquer to finish the pieces before assembly. I was reading ””Lucky Dawgs””:http://lumberjocks.com/projects/32178 post while waiting for the finish to dry which gave me a good idea for some pulls (but the button holes I had were too big). 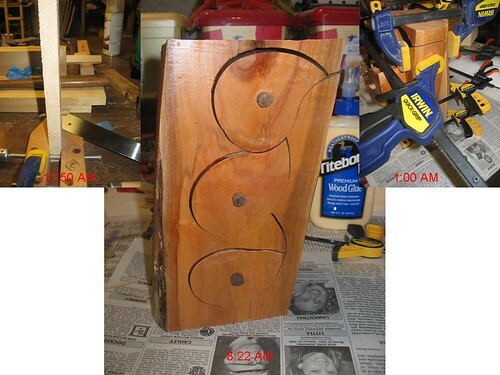 I built this real quick jig to cut some walnut Kreg plugs to the correct length, then drilled the drawers out with a forstner bit. Glue up came late. The finished project released from its bonds this morning. Thanks for looking. Hope maybe some one else gives it try. I have the odd feeling I will be making more of these, I had a lot of fun. I really like your box.